With summer brings the opportunity for a variety of fun adventures in Central and Northwest Minnesota on land and water, and even in the air! Disclosure:We visited Central and Northwest Minnesota on a press trip with Explore Minnesota Tourism, and were the guests of its business partners. 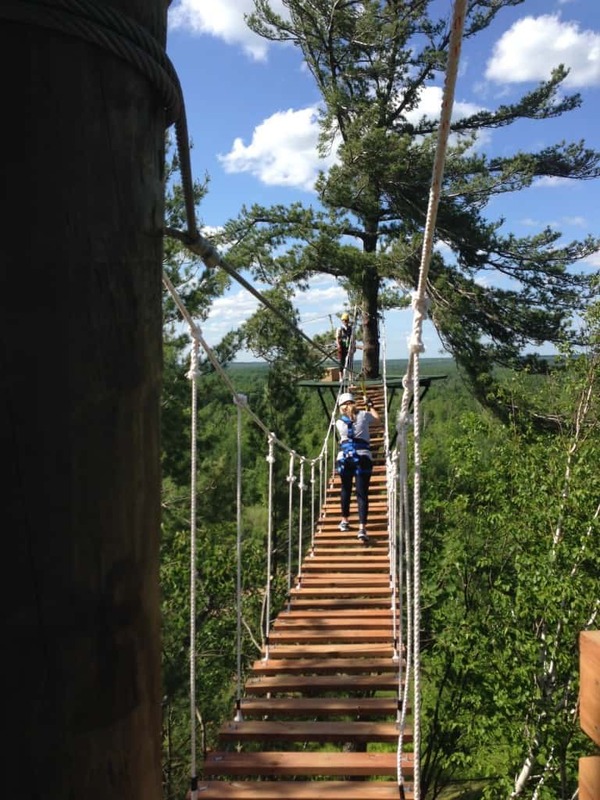 Summer fun adventures in Central and Northwest Minnesota abound for all ages! We recently rediscovered this region with new eyes after an absence of several years. Active enthusiasts will be amazed at all the options, no matter how you roll. There is no more perfect environment than a Minnesota summer to get your groove on! Come along and be inspired as we count some of the ways! Fun adventures in Central and Northwest Minnesota on the Water! Fishing: Dropping a line in has always been foremost when visitors to Central and Northwest Minnesota contemplate their choices. Anglers of all ages and abilities will discover that they can enjoy an experience tailored just for them on any number of the plentiful lakes for which this region is famous. Numerous private guide services using all kinds of watercraft are available. We had a fun-filled fishing adventure on Lake Mille Lacs with Mike Verdeja and his crew from McQuoid’s Inn. Located on the southeast side of this enormous lake in the lovely little town of Isle, McQuoids offers condos, cabins, hotel rooms, and conference facilities. But the real story is their guided fishing experiences. 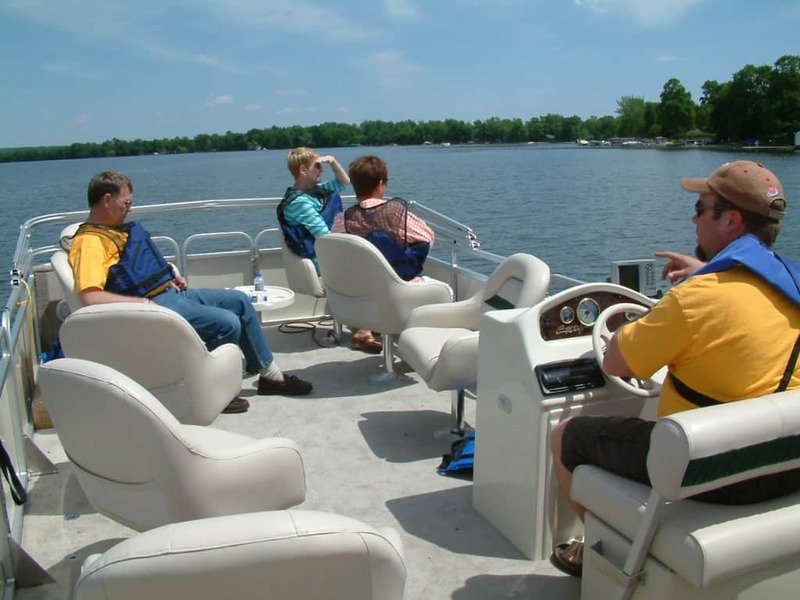 Signature red and yellow launch-style boats are comfortable and spacious for groups. 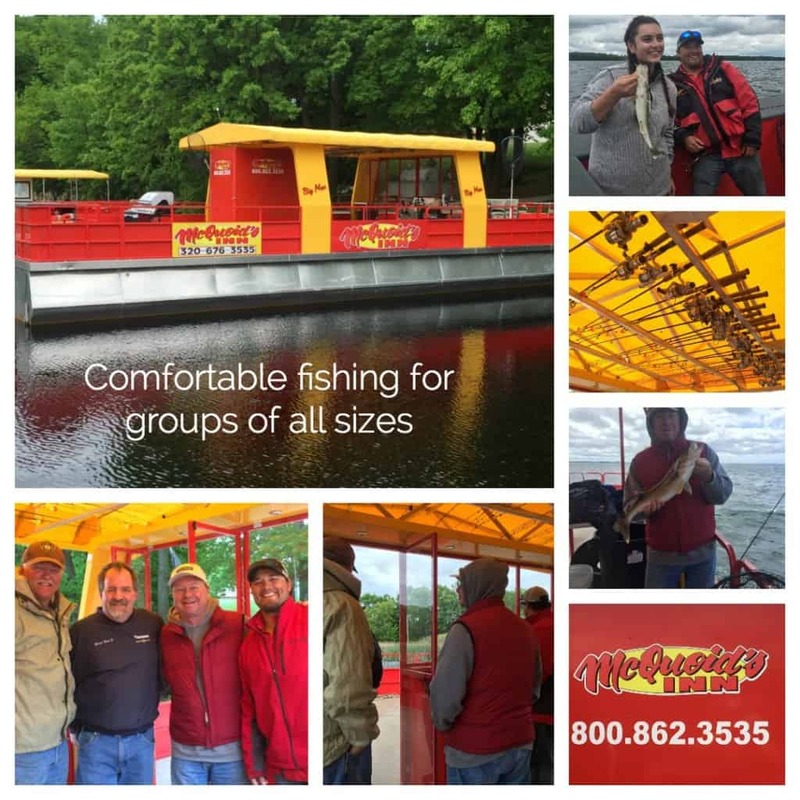 Mike and his crew know all the best spots to fish for walleye, crappie, perch, bass, and even muskie on this enormous lake, which is larger in area than several Minnesota counties. If you’re at all squeamish, they’ll even bait your hook and net your catch. If you are or know a senior citizen, military veteran, or person with a disability who doesn’t have a means to get on the water easily, the Let’s Go Fishing program is ready to help. We spent a wonderful evening on Big Detroit Lake with Detroit Lakes Area Chapter (phone: 218-847-5670) skipper Dave Hochhalter and other volunteers. Regaling us with Ole and Lena and Lutheran jokes on our sunset pontoon ride, our hosts downplayed their chapter’s impressive statistics: over 600 trips in eight years serving 5,600 people and over 100 organizations. Last year, the chapter made 131 trips during May – September at no cost for participants. LGF’s pontoon boats are safe, handicap-accessible and come equipped with life vests, fishing gear and bait, refreshments and a volunteer guide. Paddling: The Crow Wing River, east of Park Rapids, has long been a watery highway. Ojibwe and Dakota Indians used its high banks for gatherings and religious ceremonies. Hudson Bay Company representatives met native and voyageur trappers at boat landings with ox carts; evidence of the landings and ox cart trails still exists. Today, the Crow Wing River State Water Trail will provide both flatwater and gentle whitewater paddling opportunities for couples, family and group trips. Abandoned logging settlements and “dead heads” (logs which were sunk or wedged to create passageways for lumber to float downstream for milling) can still be seen in its crystal clear waters. Plan your Crow Wing River outing with Huntersville Canoe Outfitters, who provide long-term parking, personal attention geared toward your experience level, delivery and pickup shuttles, aluminum canoes, kayaks, tubes, life preservers and cushions, rain and camping gear. Groups of 12 or more can take advantage of a full canoe and camping package for as little as $22 per person. Cruising: We happen to think sometimes the best exercise is that of hand to mouth! There is absolutely no shame in shaping your active water experience to include a luxury cruise! 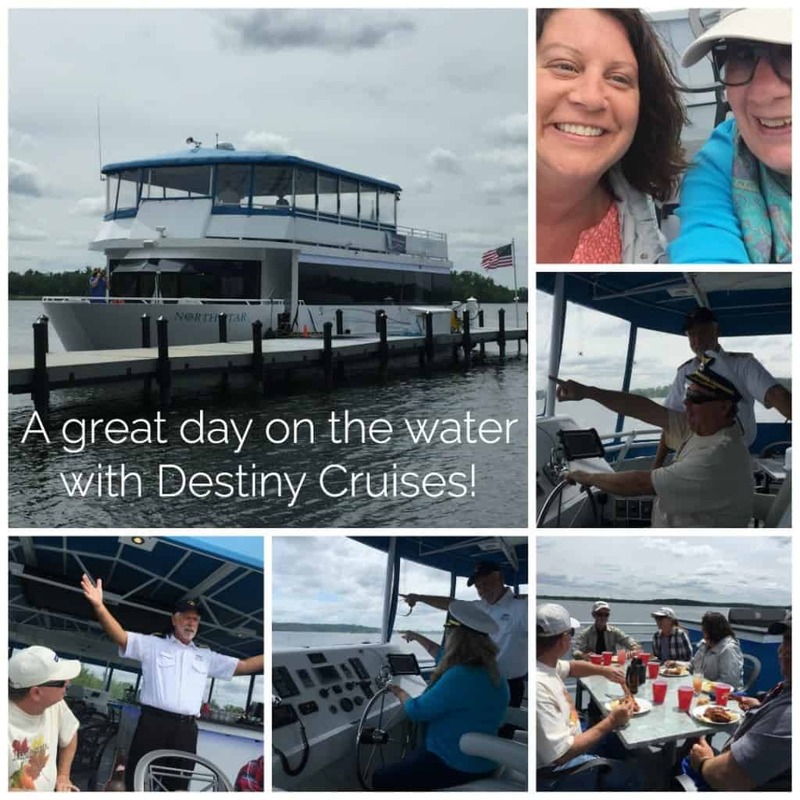 On beautiful Gull Lake, outside of Brainerd, Destiny Cruises offers a day of great cuisine and scenic perfection, viewed from its new multi-deck yacht, the North Star. 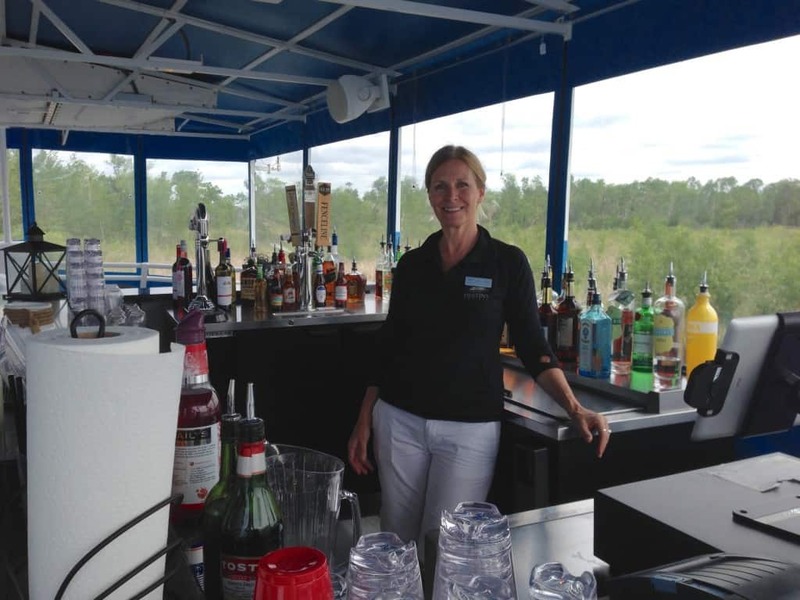 Our excursion was made all the more enjoyable by the custom libations expertly poured by General Manager Michele Baker and pithy commentary from the North Star’s captain. Our group hung out on the sunny top observation deck and enjoyed a fabulous gourmet meal. Other passengers had a wonderful experience in the spacious indoor salon below us, as well. Fun adventures in Central and Northwest Minnesota on Land! Golf: Minnesotans love their golf! This can surprise visitors who think the majority of the year here is spent under snow and ice. But in fact, according to Golf.com, Minnesota “exudes golfiness.” More golf is played per capita in Minnesota than any other state. Even more impressive: Minnesota is the only state to have hosted every one of the 17 separate U. S. Golf Association championships over the past 100 years (beginning with the 1916 U.S. Open). 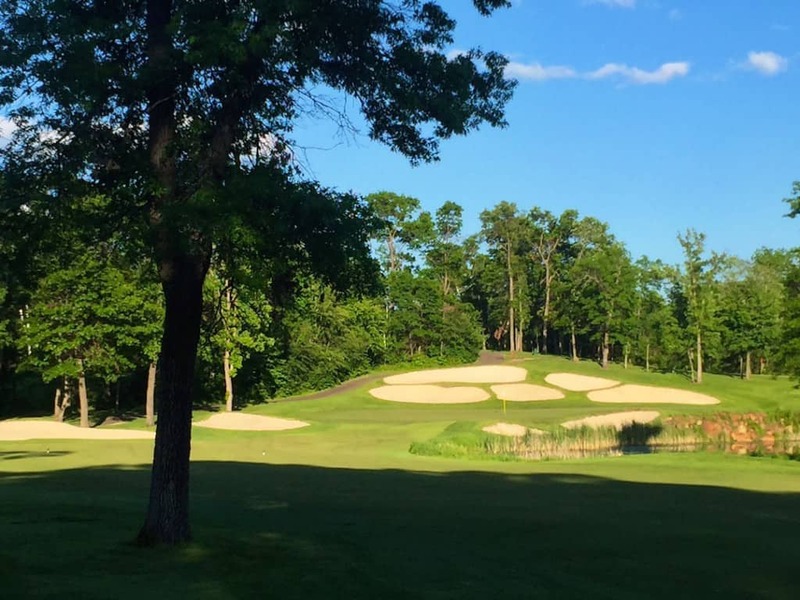 Near Lake Mille Lacs: The Minnesota National Golf Course, designed by famous architect Joel Goldstrand, is an 18-hole course covering over 600 acres, surrounded by a wilderness of dense forests and wildlife habitat. Resort courses include Izatys, Northwood Hills and Fiddlestix Golf Clubs by Appeldoorns, and Ruttger’s Bay Lake. Other courses open to the public include Stones Throw, Spring Brook, Emily Greens and Cuyuna Rolling Hills. Near Brainerd Lakes Area: More than 24 public courses feature affordable summer fees, and award-winning championship courses designed by famous names such as Robert Trent Jones, Jr. and Arnold Palmer Design Group. Resorts such as Cragun’s, Grand View Lodge, Breezy Point, and Madden’s on Gull Lake (see our separate review here) offer distinct options to serve all handicaps. Near Park Rapids: Headwaters Golf Club offers a par 72, 18 hole course; Eagle View Golf Course (tel. 218-732-7102) is a par 64, 18 hole experience. Resort options are Bears Den at Timberlane Resort and Blueberry Pines Golf, Dining and Event Center. Near Detroit Lakes: Numerous options to play 9 or 18 holes include Detroit Country Club, Ironman, Wildflower, Forest Hills, and Maple Hills. Biking: A variety of options draw biking enthusiasts throughout Central and Northwestern Minnesota. The multiple use, paved Heartland Trail covers 49 miles between Park Rapids and Cass Lake, linking Park Rapids, Dorset, Nevis, Akeley and Cass Lake mostly along abandoned railroad lines. This affords a level biking experience, part of which has parallel grassy surface for horseback riding and studded snowmobiling in winter. The Paul Bunyan Trail goes from Brainerd to Bemidji along 120 paved miles, connecting diverse communities along former railway lines. Additional trails, such as Mi-Gi-Zi and Itasca Wilderness, feed into the system. Detroit Mountain Recreation Area is unique in offering 15 challenging mountain bike downhill segments along with 4 gravity trails. Contour and downhill flow trails along with skills courses designed to teach technical proficiency, as well as an Adventure Zone for younger riders are offered. This is one of Detroit Lakes’ newest attractions, the result of unique, cooperative fundraising efforts. Adverse weather prevented our planned biking experience at Detroit Mountain, but we were impressed by the culmination of efforts to make this a go-to destination for adventure-seekers throughout the year. Northern Cycle, with locations in Park Rapids (tel. 218-732-5971) and Bemidji (tel. 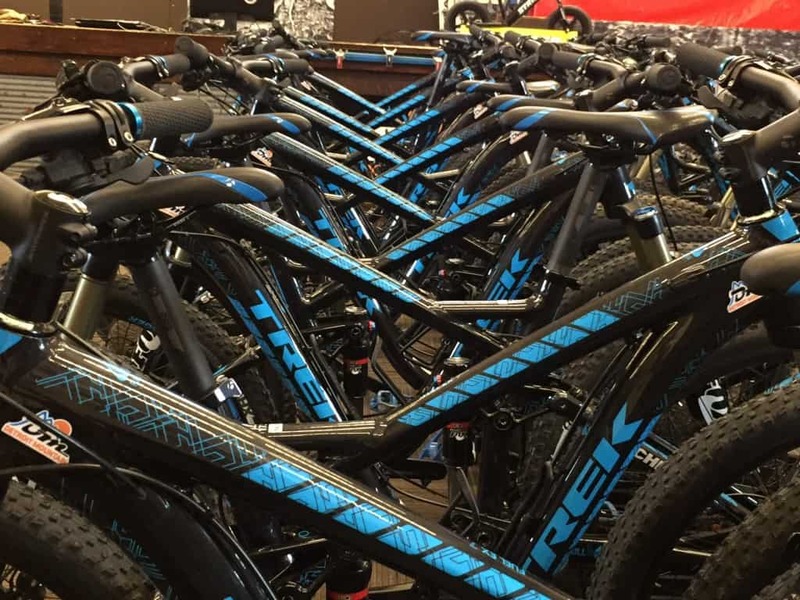 218-751-2453) offers mountain and cross bikes, trail-a-bikes, child trailers, tandem and recumbents, and road bikes (all including helmet) at hourly, daily and weekly rates. Hiking: North Country National Scenic Trail‘s Laurentian and Itasca Moraine segments are part of the overall 4,600 mile hiking route which runs from New York to North Dakota. Trails at Itasca State Park range from 200 feet to just under 10 miles in length. Self-guided, accessible and interpretive options. Additional trails in the Detroit Lakes area can be found at Maplewood State Park, Buffalo River State Park, the Pine to Prairie Birding Trail, Dunton Locks County Park, Sucker Creek Preserve, and in the vicinity of the Tamarac National Wildlife Refuge. Fun adventures in Central and Northwest Minnesota in the Air! If you had suggested I’d spend my 62nd birthday ziplining and undertaking a rope bridge suspended over 50 feet in the air, I’d have said you were crazy. Except now that I have, I heartily recommend you try it! Facing my fear of heights head on was exhilarating! 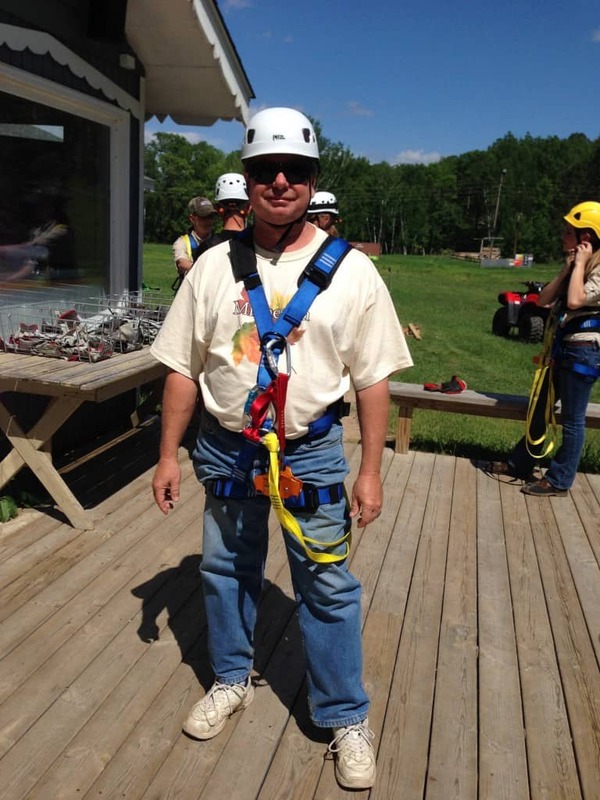 Both Pete and I had a great time at the Brainerd Zip Line Tour from Minnesota Zip Lines and Adventures. 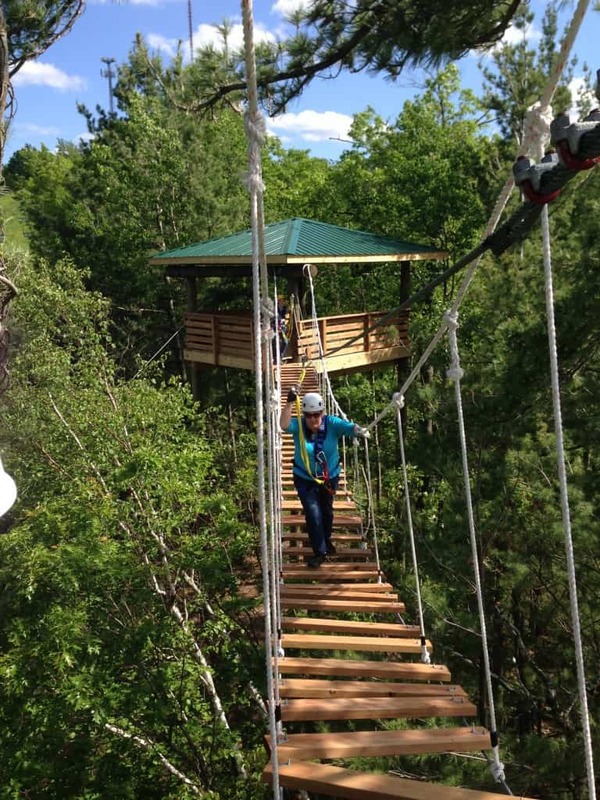 Their Brainerd location includes seven zip lines, a 50ft. suspension bridge and an optional 50ft free-fall. You’ll spend a couple of hours in the company of experienced guides who will train and assist you. Check out our video and photos below! 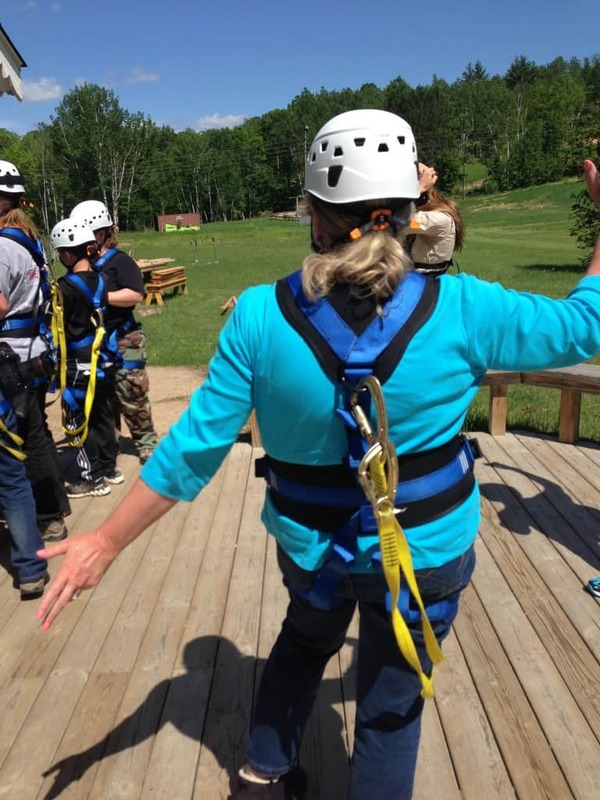 Outside Park Rapids, Trust C4 Character Challenge Course offers a high ropes course, zip line, high low challenges and team building programs for families and teams from schools, colleges, corporate and faith-based environments. Custom adventures are geared toward trust, teamwork and leadership. 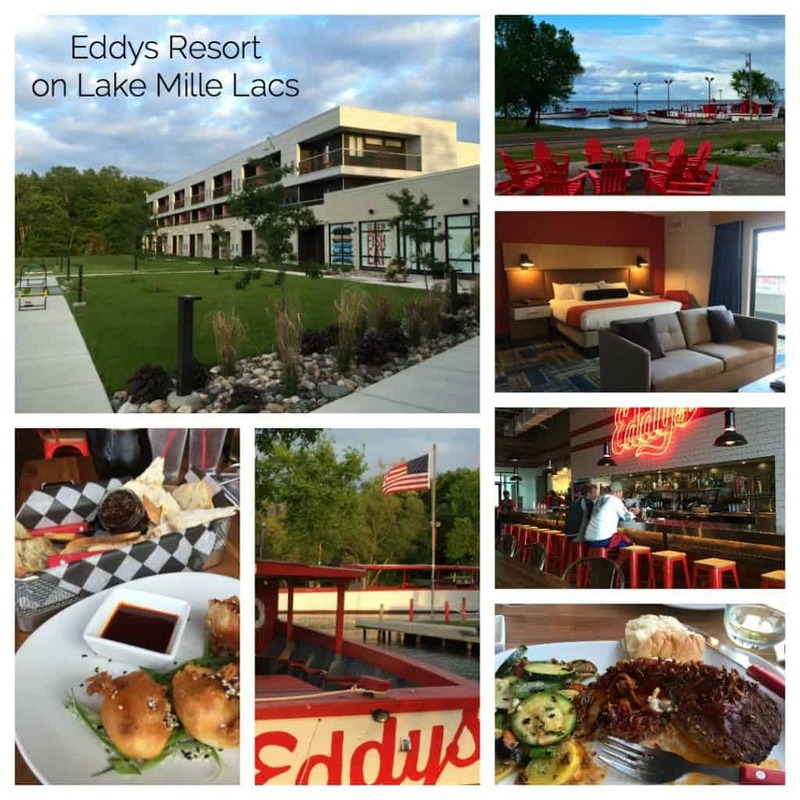 Eddy’s Resort – Established in 1960 as a place to stay with handcrafted launches for guided fishing on Lake Mille Lacs, Eddys has been completely refurbished by its current owners, the MLCV (formerly the Corporate Commission of the Lake Mille Lacs Band of Ojibwe). Eddys has 64 guest rooms, including suites and four separate cabins. Our luxury lake view suite came equipped with a spacious seating area, free wifi, coffee service and refrigerator, and 42″ flat screen TV. The ensuite bath had a separate shower and soaking tub. Fishing with experienced guides on Eddys signature launches and small boats is available for groups ranging from two to 45 people. The Launch Gastropub at Eddys serves up a variety of craft beers, cocktails and a tasty menu with signature appetizers, sandwiches and entrees. Madden’s on Gull Lake is a classic choice for visitors in the Brainerd Lakes area. See our full review here: The Magic of Madden’s on Gull Lake. In Detroit Lakes, we stayed at Holiday Inn on the Lake, a three-star property with private beach, restaurant and beach bar and grill. Our king jacuzzi suite overlooked the lake. Holiday Inn on the Lake bills itself as the entertainment and sports hub for Big Detroit Lake, featuring DJ and karaoke on Friday nights, and a multi-tiered outdoor patio with fireplaces. Disclosure: We were the guests of Explore Minnesota Tourism, Lake Mille Lacs Area Tourism, Eddys Resort, McQuoids Inn, Brainerd Chamber of Commerce, Madden’s on Gull Lake, Destiny Cruises, Brainerd Zip Line, Visit Park Rapids, Let’s Go Fishing Detroit Lakes, Detroit Mountain, and Holiday Inn on the Lake on this fun-filled trip. Although we’ve long been familiar with Central and Northwest Minnesota by virtue of being life-long Minnesotans, we hope you’ll be inspired by the wealth of activities available to active summer adventure-seekers. Minnisota sure sounds like it has a lot to offer…who’d have credited it? I guess the thing that puts me off visiting this part of the U.S. os the weather? But from reading yr post and looking at the wonderful pictures, it seems I don’t need to worry so much. And zip lining looks fun! Hi Rebecca – Summer in Minnesota is heavenly, and autumn is not far behind. You do need to embrace winter here (and scheduling a warm weather vacation is a great tactic). I remember a couple of family picnic days in Detroit Lakes with cousins and aunts and uncles when I was a child. Lovely place. The Ole and Lena and Lutheran jokes sound like such fun (and so Minnesotan although Manitobans appreciate them too). Hi Donna – Yes, great (and clean!) fun, all of it! What a wonderful way to explore the region and participate in the many recreational and even sport activities. Need to put this on my plate of places to visit soon! Hi Noel – I think you’d love it. Even though you and we are island people, there is still much to enjoy! Thanks for all the tips. Minnesota is one of the few US states I haven’t visited properly. (I don’t count the 6 hours of sleep in a Mall of America hotel when forced to fly to Minneapolis from Chicago in order to get home to Philly). I’m not sure I would have gone along with the high rope/ziplining activities for my 62nd birthday. I figure that now that I’ve achieved that august age, if I don’t want to do something, I don’t have to. Looks like a lot of fun in the land of 10,000 lakes! Wrong time of year, I know, but there is also some pretty good skiing in Minnesota. Hi GypsyNesters – Yes, Detroit Mountain is a popular skiing destination in winter, too. Normally bloggers are about 20- which experience and write about activities like you do 😉 It looks like fun! Hi Grey World Nomads – A wonderful compliment we are happy to accept! Thanks! So many fun things to do in Minnesota. Can’t believe we haven’t spent any time there. I’d love the fishing, golfing and hiking but that zip-line thing – no way! You and Pete are really brave looks like you had a wonderful time. Hi Sue – It was great fun! If you’d asked me ahead of time, I might have declined. Knowing what I know now, that would have been a mistake! I’d try it again! This is awesome! You guys look like you’re having so much fun! Glad you enjoyed it! Thanks for sharing a part of the adventure with us! Hi Morgan – We surely did! Thanks! I would love to take a bike ride on Detroit Mountain as well as a first experience of ziplining. Hi Shri – We found it all lots of fun, thanks! I’m having plan for traveling and your post is really awesome. Thank you so much!